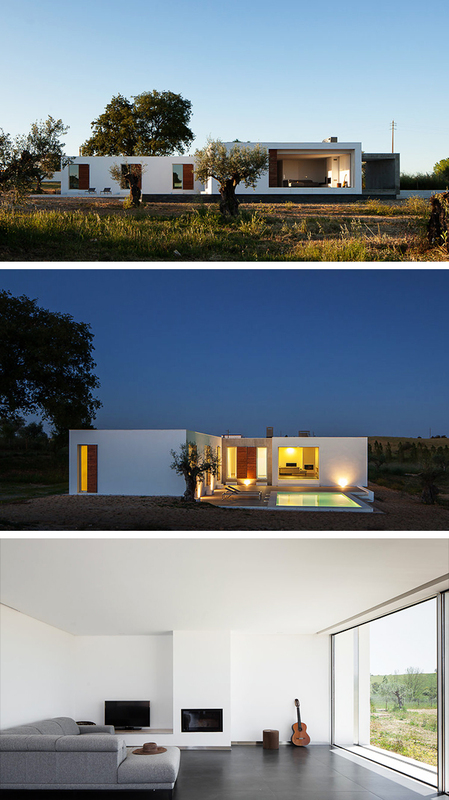 This weekend retreat in Santarem, Portugal was designed by Vasco Cabral + Sofia Saraiva (CSAA) consisting of three distinct areas. 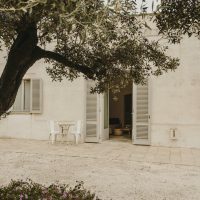 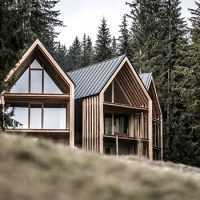 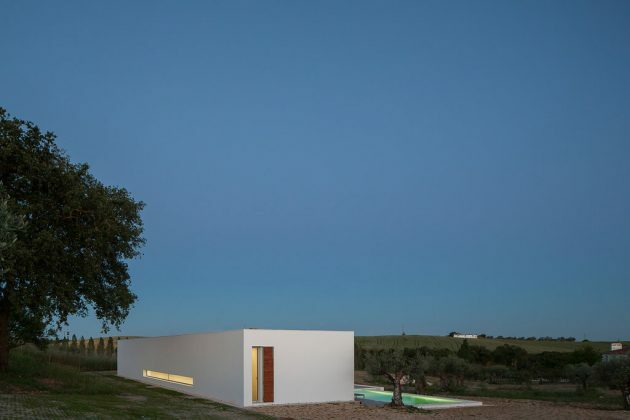 The Ring House is a minimalist home on a beautiful location and with its 2,583 square feet of living spaces, it offers its inhabitants a social area, service area and a private area, each of which in a separate functional area. 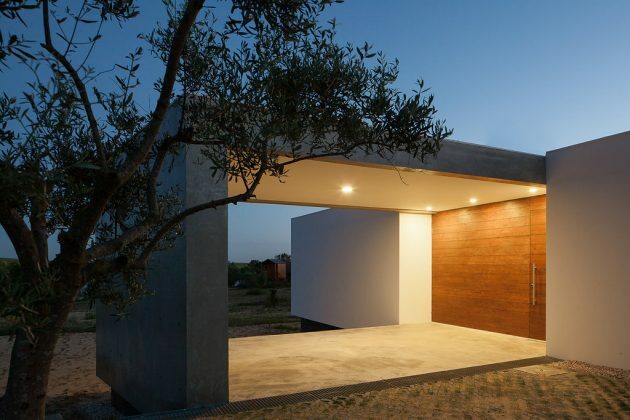 In between them are the kitchen and toilet areas and thanks to the L-shaped arrangement of the spaces, the outdoor areas are kept private. 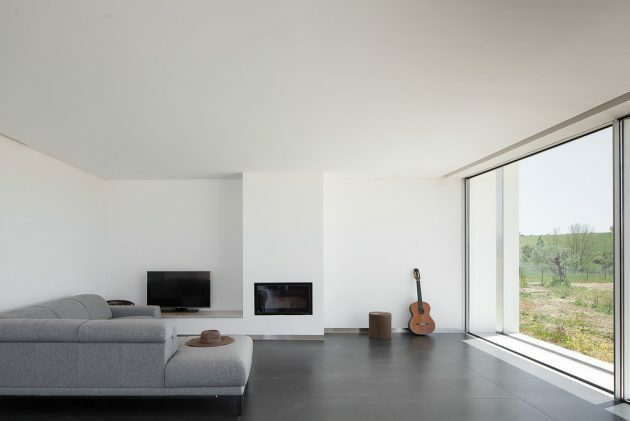 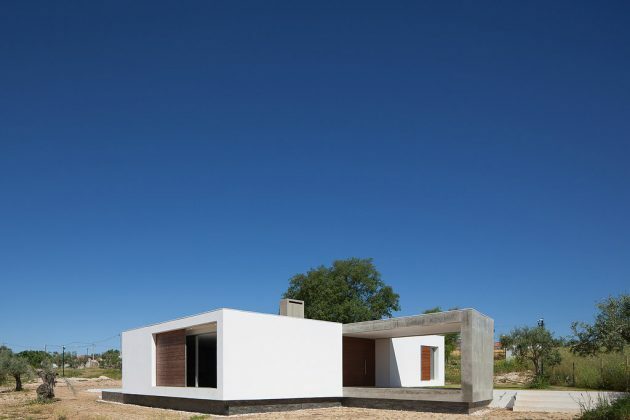 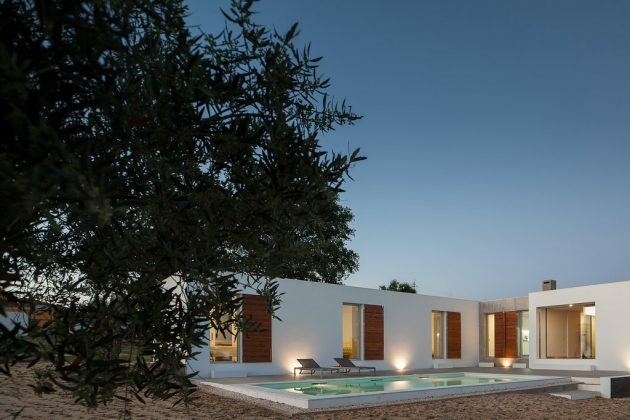 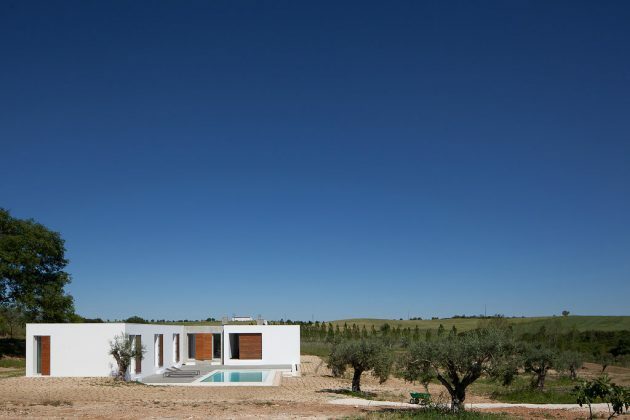 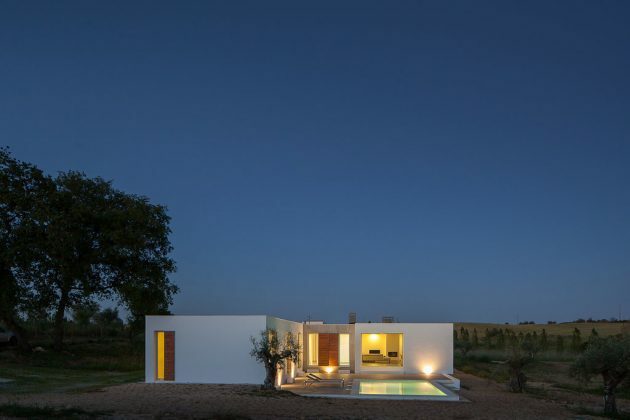 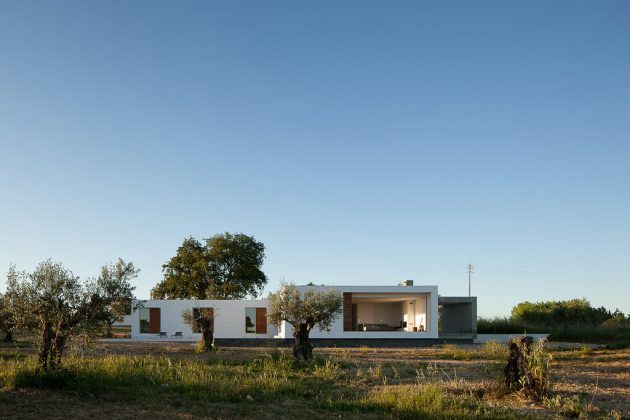 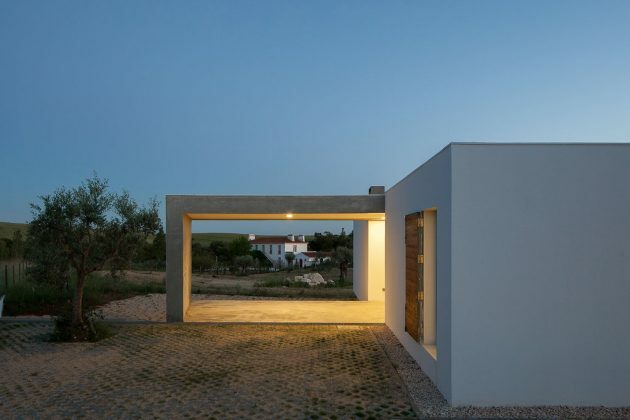 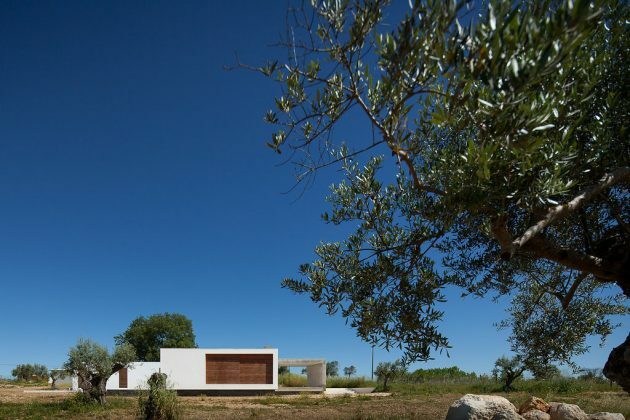 Located in Santarém (centre), Portugal, the Ring House is a weekend retreat for a family of four that will eventually become their primary residence. 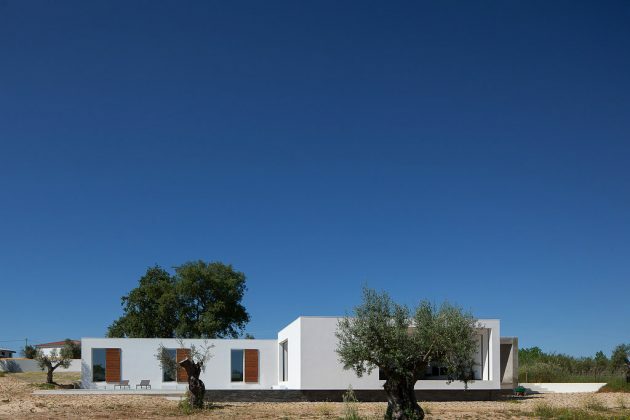 In terms of concept, it was intended to create a dwelling with characteristics and urban interior finishes, that manage to integrate into the rural and more traditional context of Santarém. 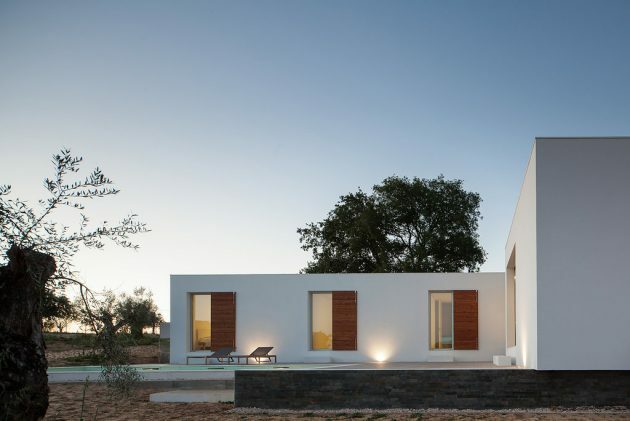 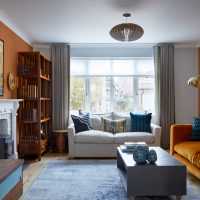 Designed to be a single storey dwelling and situated on top of a gentle slope, it allows a quiet and serene usufruct that derives from the privileged relationship between the interior and the exterior. 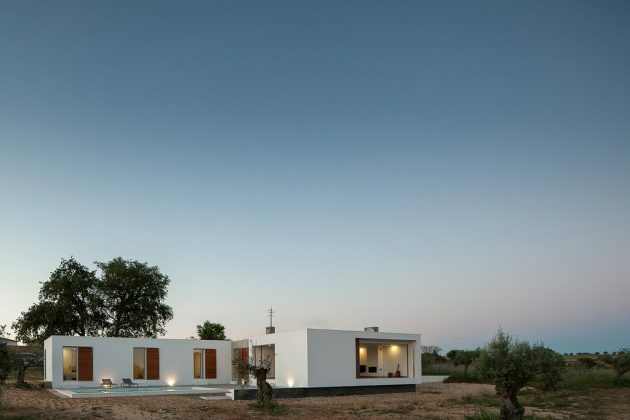 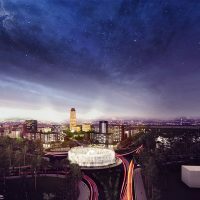 The Ring House consists of three well-defined functional areas, a social area, a service area and a private area. 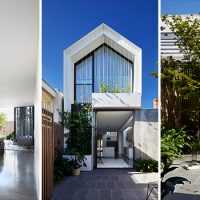 The latter, which has a longer body with East-West orientation, acts as a barrier to the street that passes north. 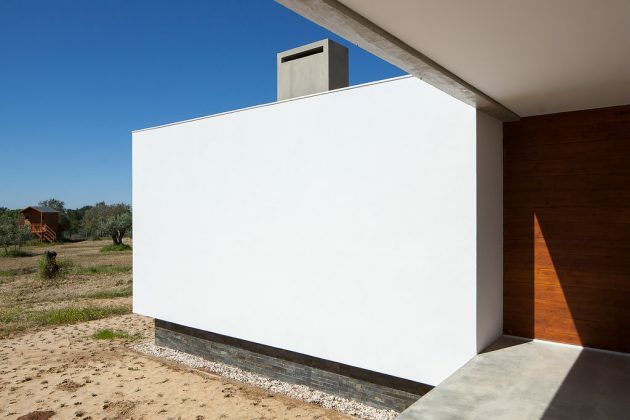 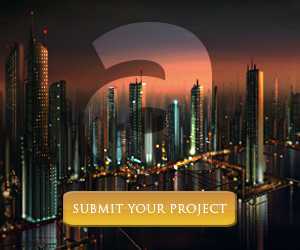 This barrier allows the creation of a private social area, consisting of a terrace with swimming pool to the South. 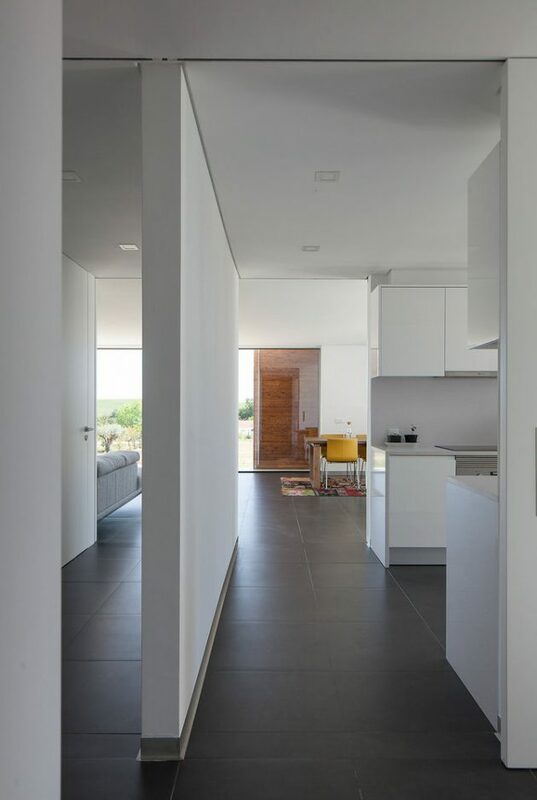 Between the Private area (to the North) and the Social area (to the South) is the Services area, which contains the main entrance of the House the East), a Kitchen, a toilet and a technical area. 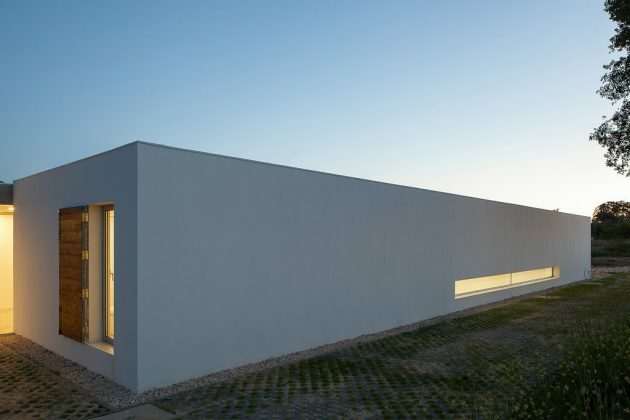 The L-shaped volumetric arrangement allows the separation of the exterior areas, arranging them according to the degree of privacy desired around the house. 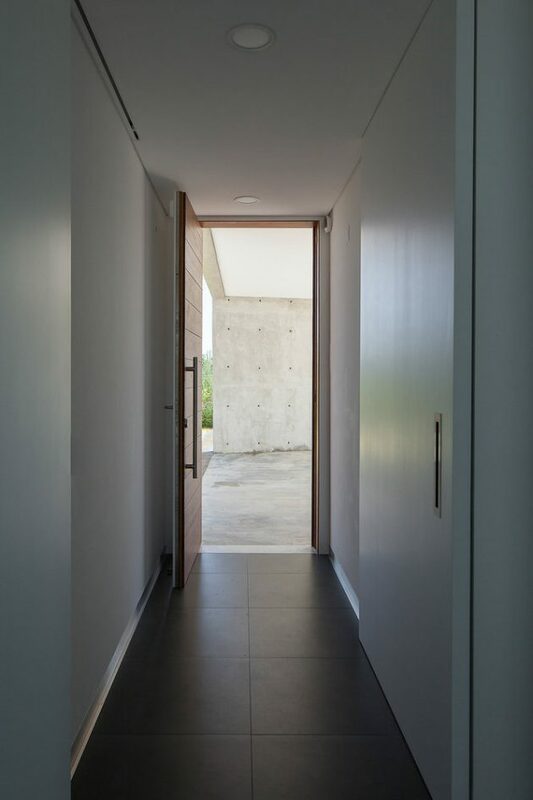 On the East side of the House next to the entrance door, from the outside, a covered area (ring) was created to access the Entrance. 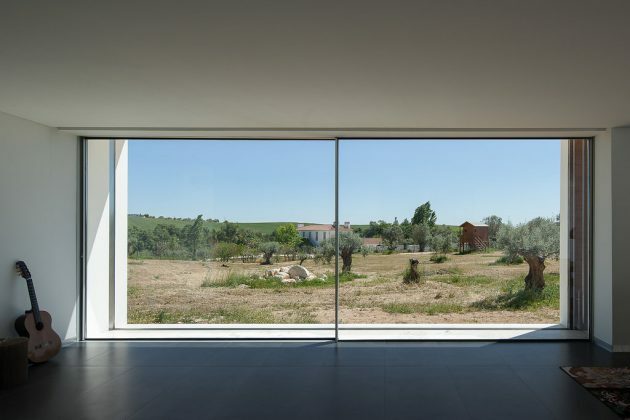 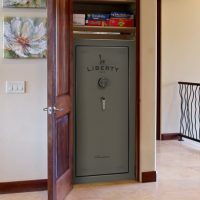 This allows car parking and because it is a more exposed area, has a less private aspect. 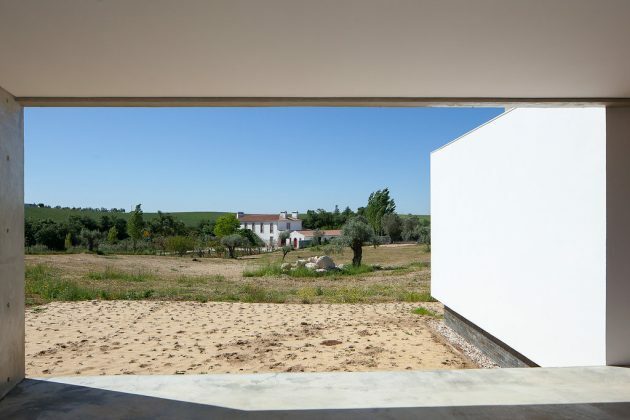 The entire area north of the house acts as an access to the Entrance of the House (the East) and is exposed to the street. 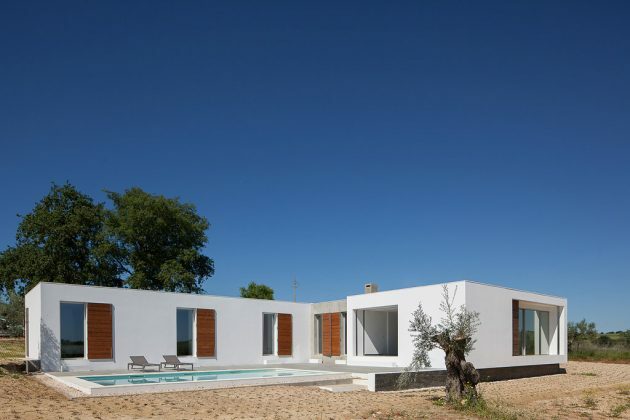 To the south, and visually protected by the volume of the sleeping area, there is the outdoor terrace with the pool, lowered relative to the interior level of the House, where it was sought with the difference clearly distinguishing the physical separation between the interior and exterior, maintaining, however, a strong visual connection. 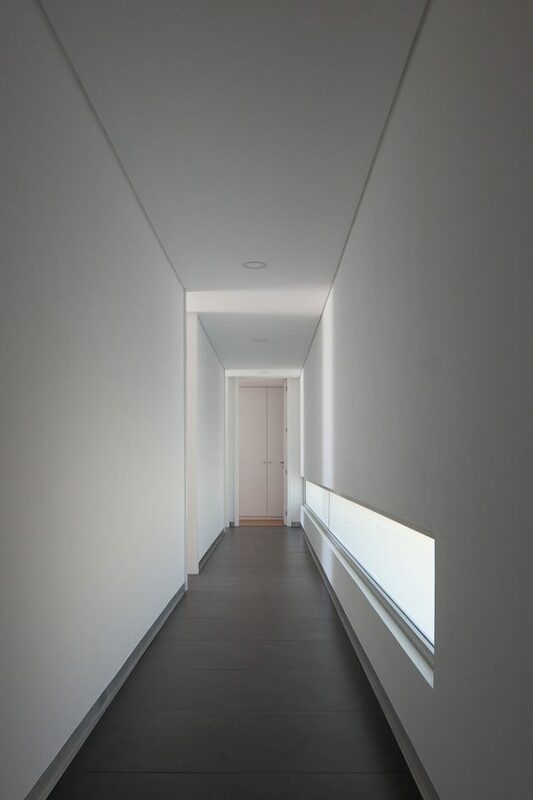 One of the most striking elements of the architecture of the house is the long longitudinal “tear” on the North facade, which makes the natural illumination of the corridor that serves the private area of the house. 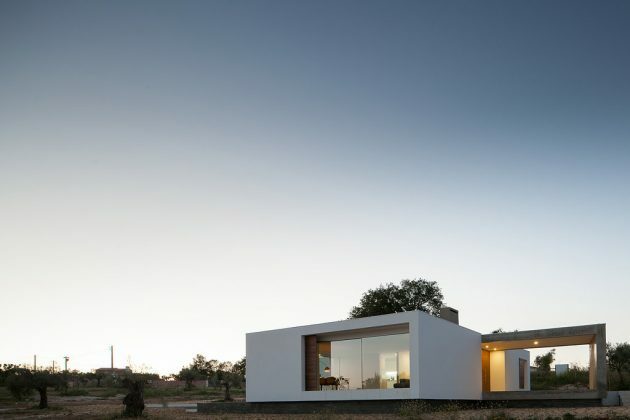 The Ring house floorplan seeks to combine the will of a family living in an urban environment, with the need for it to feel closer contact with nature.